The Downs close to Epsom have always been one of the green lungs of the greater London area and even became something of a spa with the discovery of Epsom Salts in 1618. The popularity of Epsom Spring Water lasted for a couple of decades until it gradually went out of fashion and the old well was locked up in 1727 (Pownall, 1825). But even with a regular stream of weekend ramblers from the city, the Downs basically remained a nice place out in the middle of nowhere - and the sole reason to build a railway line terminus there was horse racing. Organised racing was held on a regular basis and was so popular that it found its way into the diaries of Samuel Pepys on three occasions in 1663. On the 4th of May 1780 Edward Smith-Stanley, 12th Earl of Derby organised a race for himself and his friends which he named The Oaks after his estate. The event - the first "Derby" - met with instant success, and in 1784 the course was extended to its current distance of a mile and a half, and Tattenham Corner was introduced. Even in the days when no form of public transport was available, flocks of people from all over South-East England would come together on Epsom Downs to attend the races - in the 1820s, crowds of up to 80'000 were reported by the newspapers. It is therefore hardly surprising that right from the beginning of the railway age in the South East, horse racing events were seen as an important market segment. The London & Southampton Railway, for example, opened its line between Nine Elms and Woking earlier than planned in May 1838 and arranged for unscheduled train stops at a location close to where Surbiton station now stands. The result was dramatic: 5'000 people tried to get a seat at Nine Elms on "Derby Day" (Kirkby, 1983), and by the mid-19th century, attendance at the Derby was around 500,000, including the Royal Family and members of Parliament (Stanley, 1956). Race traffic continued to grow accordingly, and thus a group of local businessmen got together and formed a company known as the Banstead & Epsom Downs Railway, for which they applied to Parliament and duly received authority on 17th July 1862. The act, totalling 56 paragraphs on 18 pages, not only dealt with standard questions in conjunction with the building of a new railway line but was also set out to safeguard third party interests. Primarily, this concerned the London Brighton & South Coast Railway which had every intention of keeping its controlling power at Sutton station (now to become a junction), but it also concerned the trustees of the Ewell to Burgh Heath turnpike, which the railway planned to cross by means of a bridge, for which detailed building conditions and instructions were set up. And finally, due to fierce opposition of both the Lord of the Manor of Epsom Downs and the Epsom Grandstand Association, the original plans to build the station as close as 220 yards to the Grandstand had to be revised and the station built some 1'100 yards away from the Grandstand. And so, what is today the Epsom Downs Branch was born out of one reason only: horse-racing. It was the time of short railway line proposals all over England, a large part of which found themselves in some kind of trouble almost right after their Bill had been passed - and the Banstead & Epsom Downs Railway Company fared no better as it tried hard to raise its capital of £85,000 (the approximate equivalent of £9,350,000 today) through 8,500 shares at a nominal value of £10 each. 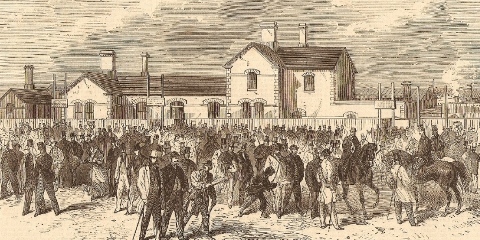 Mounting disagreement amongst the local leaders of the project resulted in the forming of bitter factions and finally brought about negotiations on the disposal of the contracts which led to a transfer of management into the hands of the London Brighton & South Coast Railway in March 1863 (Kirkby, 1983). "THE NEW RAILWAY STATION AT THE RACE-COURSE, EPSOM DOWNS." In June 1864, the Banstead & Epsom Downs Railway Company was amalgamated into the LB&SCR. The railway finally opened to traffic on 22nd May 1865, and transported some 70'000 people during the races of that week (Kirkby, 1983). 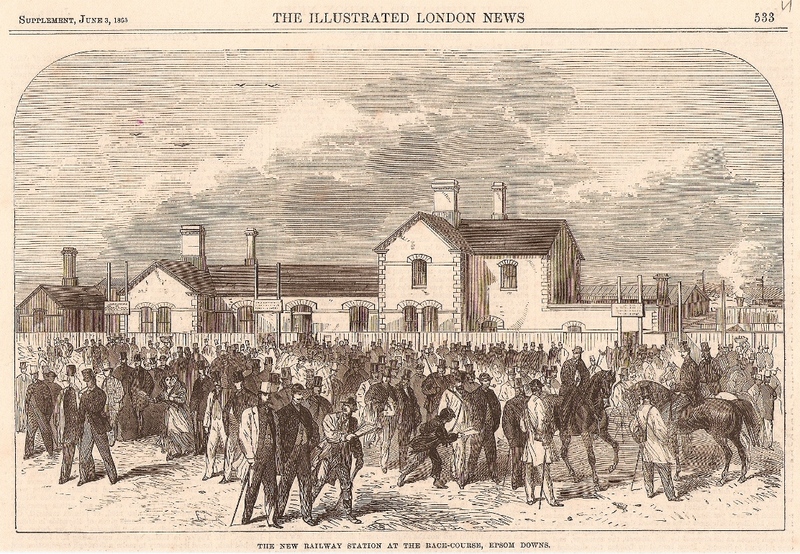 The newly built line was also reported on in the papers, and the Illustrated London News Supplement devoted half a page to an illustration of Epsom Downs station in its edition of 3rd June 1865. "A short line of railway runs hence [from Sutton] by California [i.e. Belmont], across Banstead Dozens, a range of hills commanding some very pretty and extensive scenery, at the foot of which is the station of Banstead. It extends to Epsom Downs, in the immediate neighbourhood of the Race Course." In order to accomodate the huge amount of race traffic on Derby Days, the line was double track right from the beginning of the first planning stages, with its starting point being the railway line and station at Sutton. This photograph, taken on Derby Day in 1907, shows what a large and complex affair the station at Epsom Downs was. On the extreme left, the Royal Train can be seen, and the number of signals and engine release roads (with earth mounds acting as bufferstops) is quite impressive. Sutton station had been opened by the LB&SCR in 1847 as part of the Epsom extension of the London Bridge to West Croydon line (opened in 1839) and was, in 1865, a simple through station with two platforms. Construction of the Epsom Downs branch turned Sutton into a junction, with its double track turning South immediately. Thus, while the Epsom line platforms (1 & 2) at Sutton were straight, the branch platforms (3 & 4) were (and still are) sharply curved. The entrance to the station buildings, which were mainly located in the fork of the two lines, was at street level, with passengers having to descend stairs to get to the platforms below. This picture of Sutton, which was taken in 1867, shows the station and track layout after the branch to Epsom Downs (on the left) was opened. In 1891 proposals were put forward in connection with the question as to how Tadworth (a fast growing and popular high-class residential area since the 1880s) should be connected to the railway system. A local interest group obtained an act in 1892 for the proposed "Epsom Downs Extension Railway" (the line would have run off the Epsom Downs branch near Banstead to climb southwards to Tadworth), but these plans were immediately faced with huge problems due to insufficient capital and an obvious lack of interest on the side of the LB&SCR (Kirkby, 1983). 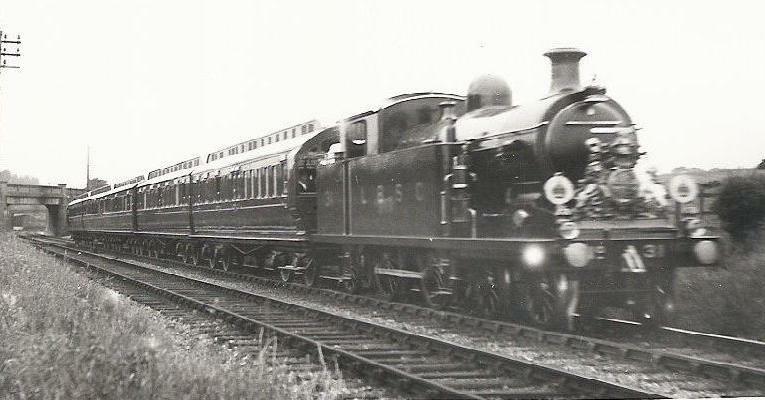 The Chipstead Valley Railway (an act for which was obtained in 1893) planned a railway from a junction wiht the LB&SCR mainline at Purley and intended to connect with the proposed Epsom Downs Extension Railway, thus creating a through line between Purley and Sutton. Eventually, the line was built from Purley to Kingswood in 1897 by the South Eastern Railway, and finally completed to Tadworth and Tattenham Corner in 1901 (Kirkby, 1983). The Epsom Downs Extension Railway never materialized, but oddly enough, Surrey County Council was required to pronounce itself in 1997 on suggestions that a rail link should be built between Tattenham Corner and Epsom Downs stations to create a loop line and shorten journey times. These plans, however, were dismissed on the grounds that construction costs would have been prohibitive in such a densely populated area. Epsom Downs station became a part of Britain's social history when militant suffragette Mary Richardson was beaten and subsequently chased to the station by an angry crowdon 4th June 1913. Before that incident, Emily Wilding Davison, who had accompanied Richardson, had stepped out in front of the King's horse during the Derby race. Davison subsequently died from her injuries, while Richardson was given refuge for several hours at the station by a porter (Atkinson, 2005). On 1st January 1923, the Epsom Downs branch together with the LB&SCR became, by act of Parliament, part of the Southern Railway - an event which proved quite decisive with respect to the electrification of the line. Whilst the LB&SCR had started building up a 6700 volts A.C. overhead electric system on its lines since 1909 (overhead wires services were actually taken up between Victoria and Sutton via West Croydon in April 1925 [Kirkby, 1983]), the Southern eventually opted for the now well-known third rail system using 750 volts D.C.
On 17th June 1928 the third rail electrification was completed to Epsom Downs - the last regular steam train on the line left Epsom Downs on that very same day. The last Royal train had run to Epsom Downs four years before, in 1924, after which date the Royals went by road. Returning to rail travel after the end of WWII, the choice fell on Tattenham Corner, which had been opened in 1901 and was more conveniently situated, i.e. closer to the Grandstand (Kirkby, 1983). The now redundant turntable at Epsom Downs was removed in February 1931 (Kirkby, 1983). Conceived and built to handle masses of trains and people on a few racing days a year, the terminus at Epsom Downs saw little traffic on regular working days - a contrast which is nicely illustrated by this 1928 scene, in which the conductor rail for electric propulsion is already in place. Epsom Downs had lost much of its glamour on derby days, in spite of continuing to welcome masses of spectators to its multiple platforms. The coming of the electric trains, however, heralded a new age - and a fundamental change to the character of the Epsom Downs branch.